The durum wheat “Senatore Cappelli” is an autumn variety selected by the agronomist and geneticist Nazareno Strampelli in 1915, which had a great performance in those years thanks to its great adaptability, rusticity and excellent quality of its semolina. This Italian wheat was dedicated to the marquis of Abruzzo Raffaelle Cappelli, who was born in San Demetrio ne’ Vestini and was Senator of the Kingdom of Italy and promoter of the Agrarian Reform. 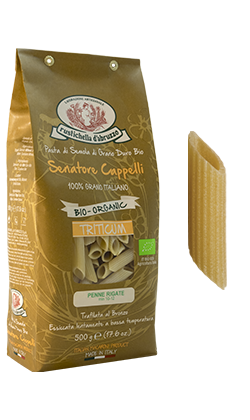 ‘Senatore Cappelli’, defined as “the most beautiful durum wheat ever cultivated”, has been the most widespread crop in South-Central Italy for years and increased the performance of plantation farms of 30%, even because of its high protein content. That is why it was nicknamed “meat of the poor ones”. It has brown/black-coloured awns and big, vitreous, translucent and amber-coloured grains; its height (120/130 cm) makes it more resistant to weed and, therefore, does not need much weeding and is suitable for organic agriculture. 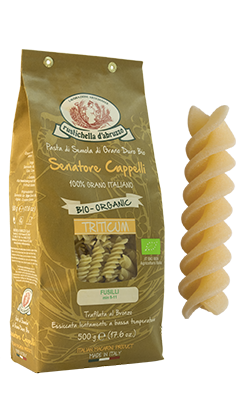 Rustichella d’Abruzzo organic durum wheat ‘Senatore Cappelli’ pasta is perfect for rediscovering the typical tastes of simple and genuine food of the past and is a product of excellence both in taste and selection of raw materials. The most famous and sold type of pasta in the world, symbol of Italy abroad. Spaghetti pasta derives its name from its appearance, which looks like “piccoli spaghi” (small twines), for its thin and long shape. Spaghetti is present in all regional culinary traditions of Italy: from the North to the South. Spaghetti is extremely versatile and perfectly matches plenty of condiments. We recommend it with Rustichella d’Abruzzo organic ‘Pomodoro e Basilico’ sauce and a bit of Rustichella raw organic Extra Virgin Olive Oil. Cooking time: 9-11 minutes. One of the oldest types of pasta. It derives its name from the “fuso”, the device used by skilled pasta makers, who used to make it by twirling rapidly the pasta around an iron rod. 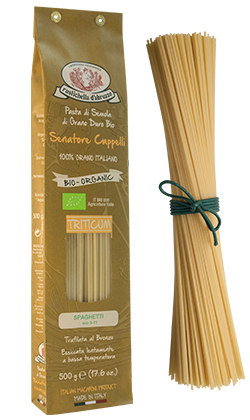 Made exclusively with top quality ‘Senatore Cappelli’ durum wheat semolina of certified Italian origin, this particular spiral-shaped pasta is excellent to collect the sauce, for example Rustichella d’Abruzzo organic ‘alla Arrabbiata’ sauce or a delicate homemade tomato and basil sauce. Cooking time: 9-11 minutes. Penne Rigate is very famous for its versatility, thanks to its design and for the presence of deep grooves on the surface, which allow it to collect any kind of condiment, both on the inside and the outside. Made with certified organic ‘Senatore Cappelli’ durum wheat semolina and an artisan production process, Rustichella d’Abruzzo recommends it with all those meat-based sauces of the Italian tradition, such as ‘rosso alla Salsiccia’ sauce or ‘alla Genovese’ sauce. Cooking time: 8-10 minutes. 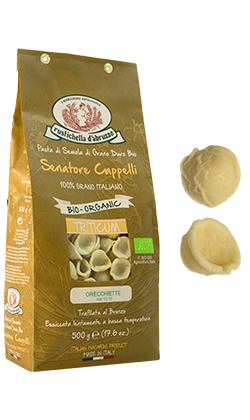 Originally from Apulia region, Orecchiette pasta’s size is nearly ¾ of a thumb and is cupola-shaped. The centre is thinner than the edge and the surface is very rough. 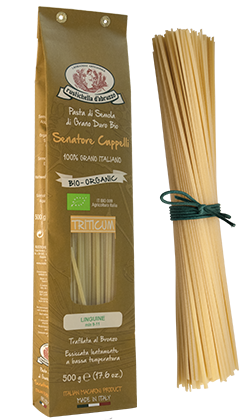 Made with certified organic ‘Senatore Cappelli’ durum wheat semolina, this type of pasta is used in lots of recipes of the Italian tradition, above all “cime di rapa” (turnip greens). We recommend it also with Rustichella d’Abruzzo ‘alla Salsiccia’ white sauce with stir-fried radicchio and a bit of Rustichella d’Abruzzo organic Extra Virgin Olive Oil. Cooking time: 13-16 minutes.